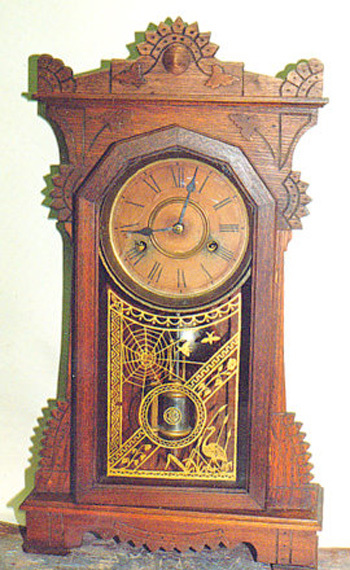 The text and images below were provided by Canadian clocks expert Jim Connell. Jane Varkaris also did some of the original research for the book that they co-authored in 1986. 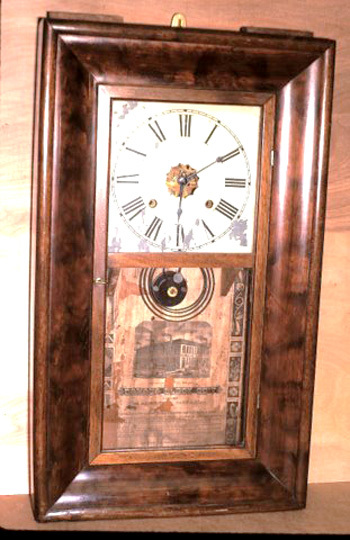 This company was the last of three sequential attempts to produce clocks by factory methods in Canada during the 1872 - 1884 period. 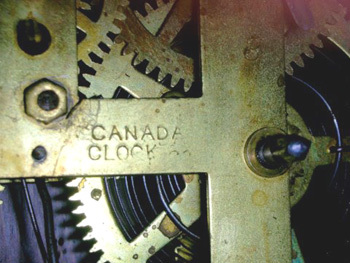 The original effort by the Canada Clock Company in Whitby, Ontario was basically unsuccessful and only limited production was achieved. 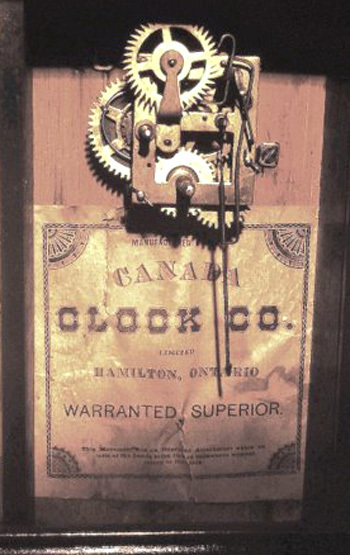 In 1876, the equipment was relocated to Hamilton, Ontario to begin a second attempt as the Hamilton Clock Company, with new investors. 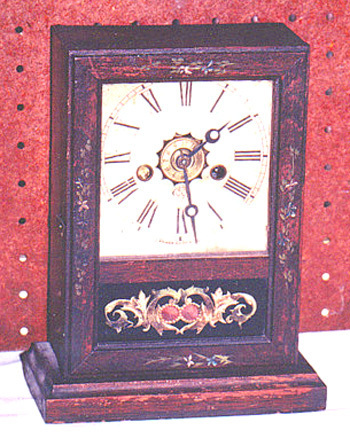 This attempt was more successful and a fairly wide range of clocks was produced. 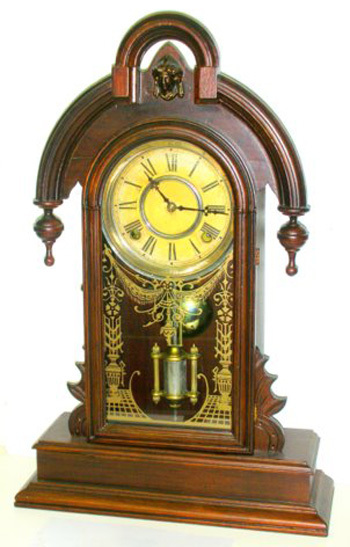 However, sales were not very large and some of the investors left the company by 1879. At that point the president, James Simpson, ended production and proceeded with a major reorganization. 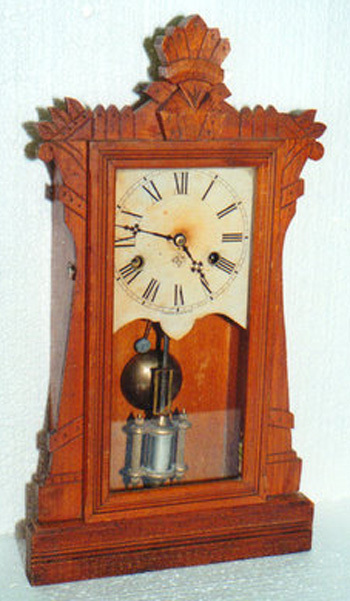 The story of the first two companies is told in more detail in other Galleries on the museum’s web site. (1) A group of new investors was found. (2) The company was incorporated as a limited liability corporation to protect the investors. 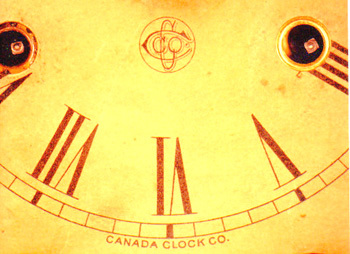 The third company was named the Canada Clock Company Limited. 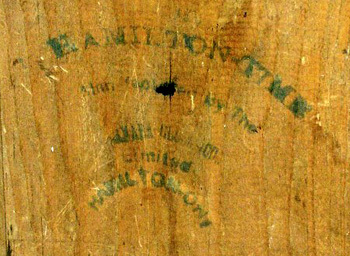 (3) The original factory in Hamilton was retained, but upgrades were made where necessary. 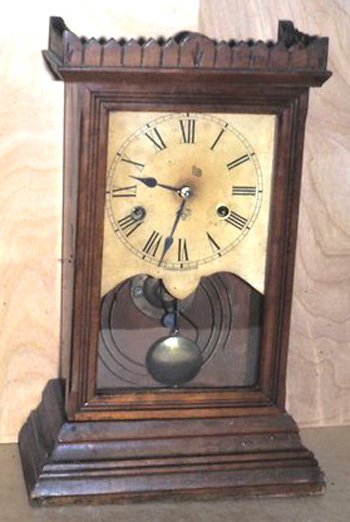 (4) The clock movements were redesigned. 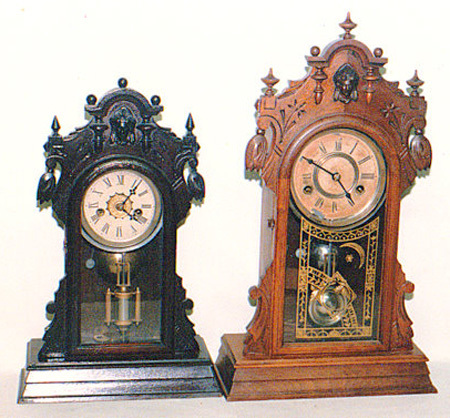 Some of the original dies were retained, but the movements show distinct changes when compared with previous production samples. 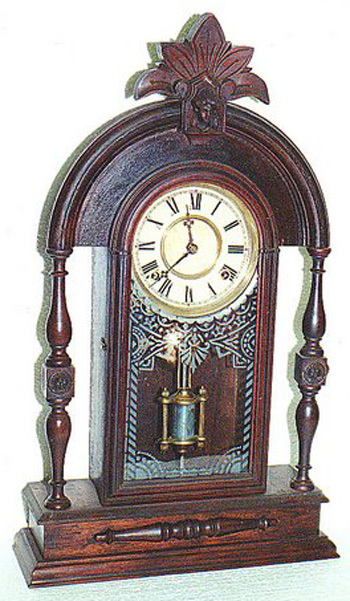 Several new variants were offered. 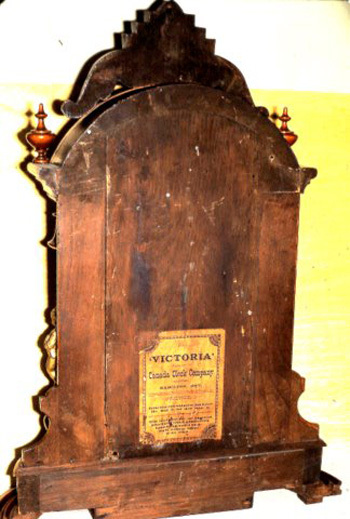 (5) Major changes were made to the design of the wood cases. 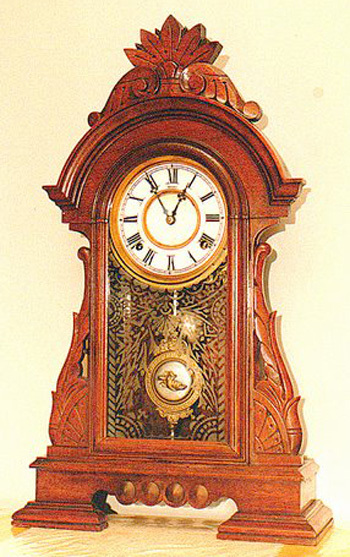 The use of veneers was abandoned, and all cases were made with solid woods that ranged from stained pine to more elegant materials such as butternut, walnut, and mahogany. 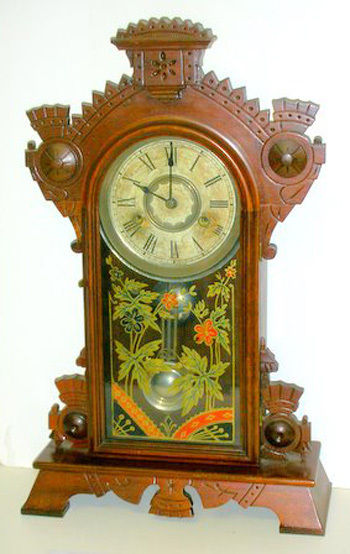 In addition, the cases were extensively decorated with turnings and hand-carved sections. 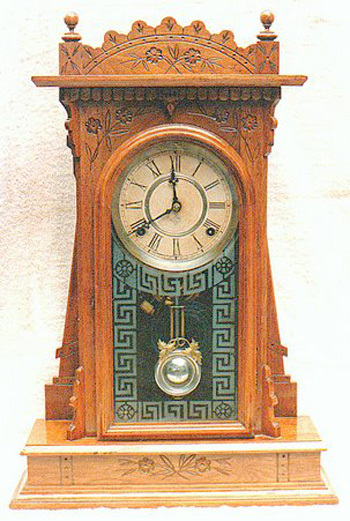 The resulting clocks in many instances were quite attractive and compared well with competitive U.S. production models. 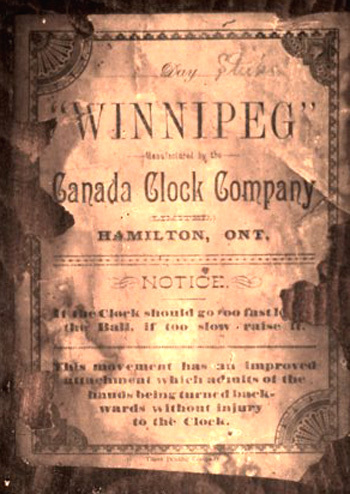 This third company enjoyed an additional advantage because of the “National Policy” introduced by the Canadian Government in 1879. This offered tariff protection to Canadian industries. 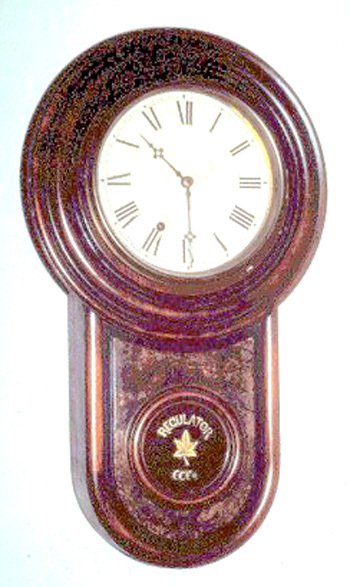 As a result, the company achieved initial success and reports in the press during 1882 commented that there were 50 employees and, in another article, that the company had exhibited 55 clocks in 43 styles and with seven different movements. 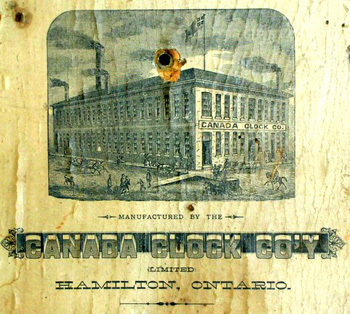 Another eye-witness account in “The Canadian Manufacturer” of 1883 described a walk through the plant, where “everything but the springs” was manufactured on site and in volume. 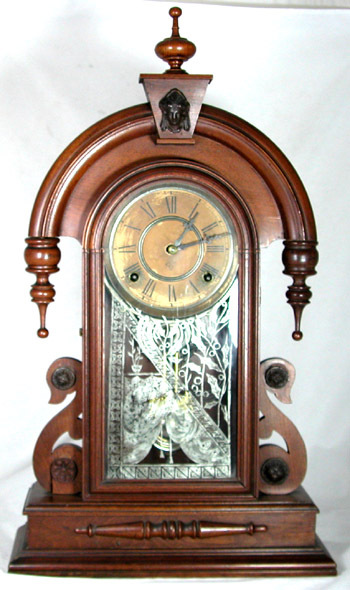 But unfortunately, everything came to a crashing halt in 1884 for some as yet unknown reason. The company went into bankruptcy and, soon after, all facilities were sold off to settle claims. Now in the early 21st century, in the light of those reports, it is difficult to understand why the company ended so badly. We can only speculate. 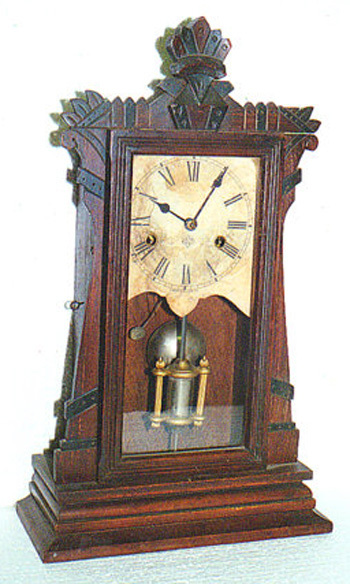 The company management had little or no experience in the production and marketing of clocks, and in spite of tariff protection, there was still effective competition from clocks imported from several foreign sources including the United States. The Canadian market was a small one. 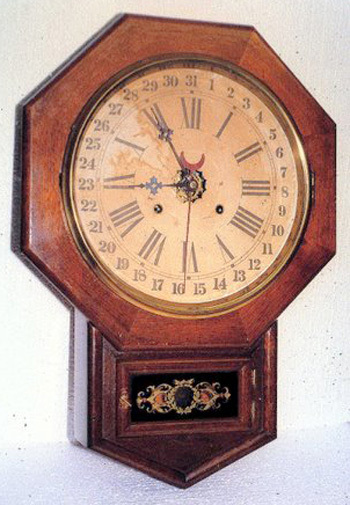 And perhaps it was becoming saturated – most families likely owned and needed only one mantel clock. In order to achieve production efficiency, large production runs would have been desirable and production may well have exceeded demand. 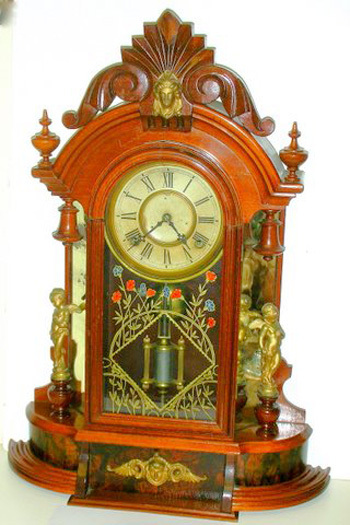 And, when one examines the clock cases, the great amount of hand labour expended in decorative turnings and carving may have resulted in labour costs that could not easily be recovered in a small market with effective competition. 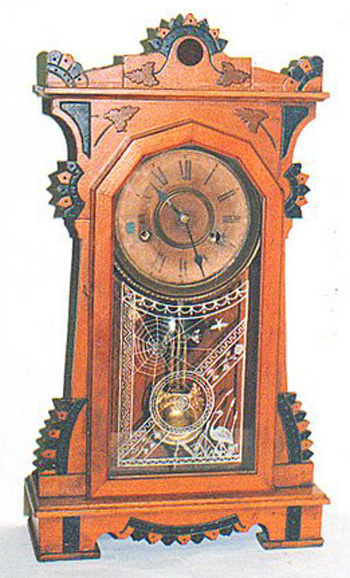 But whatever the causes of company failures, the clocks themselves are an attractive and interesting group. 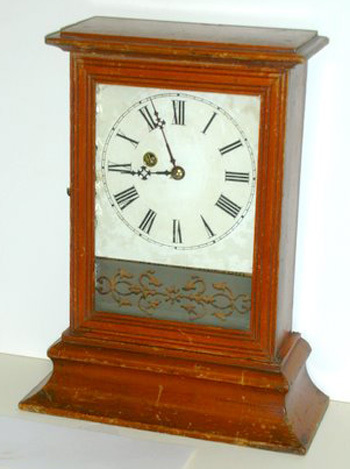 Most mantel models from all three companies were thirty-hour operation, and so today are of little interest to anyone simply interested in buying an “old” clock. 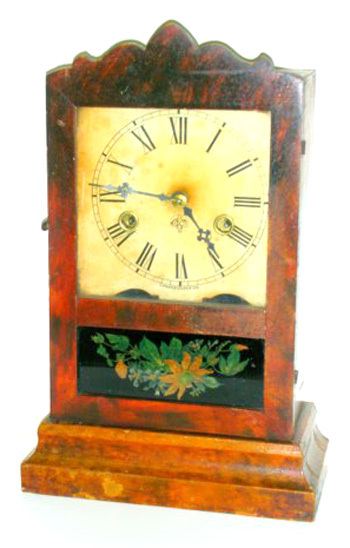 Even for collectors, they are scarce and have never achieved the popularity of the more readily available Pequegnat clocks. 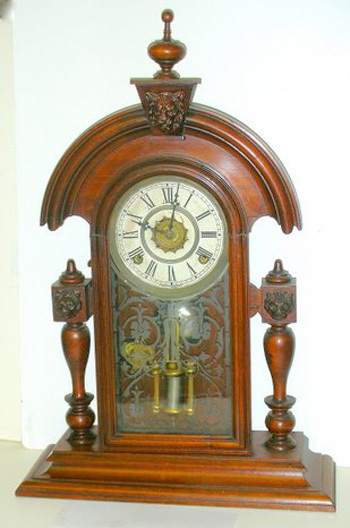 But they do have their own charm as genuine, 100% Canadian-made antiques. 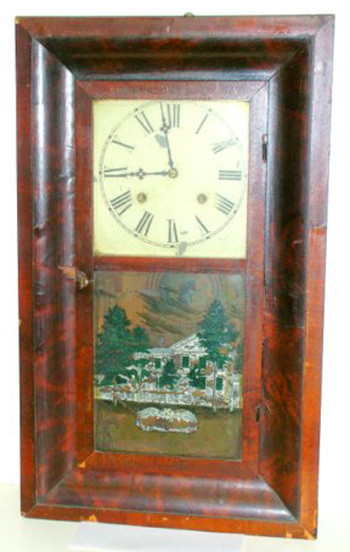 As mentioned above, clocks with veneered pine cases were no longer produced - all cases were solid woods. 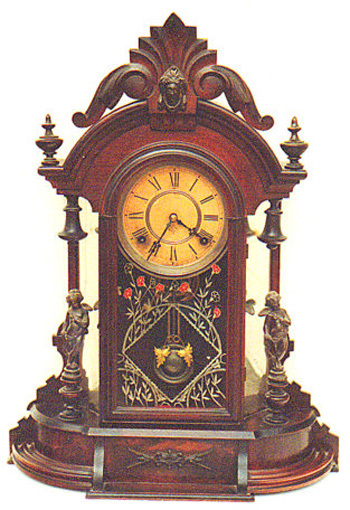 A variety of woods were used, ranging from stained pine to walnut and mahogany. 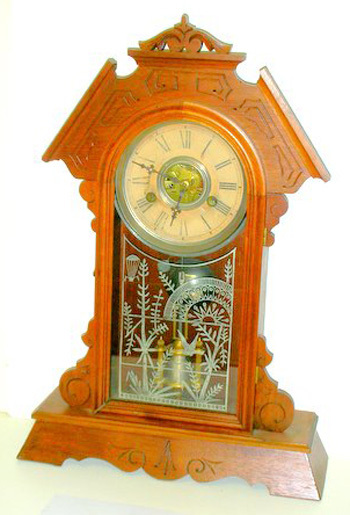 A significant quantity of butternut wood was also used. 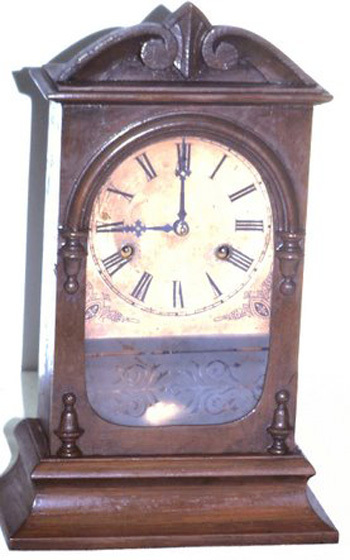 Some cases, often butternut, were given a “sponge work” finish to imitate fancy burled veneer. This practice was not commonly used by competitors. 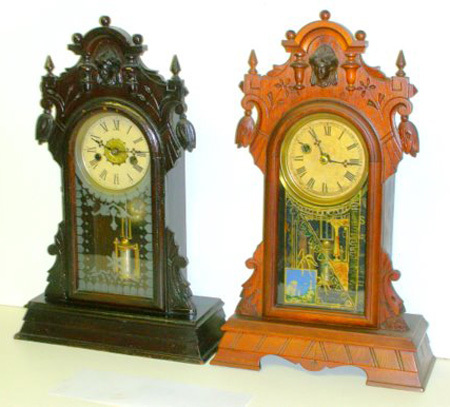 The cases themselves were offered in a wide variety of styles, ranging from simple rectangular ‘box’ forms to complex cases with many turned finials and other ornaments, as well as much hand-carved decoration. 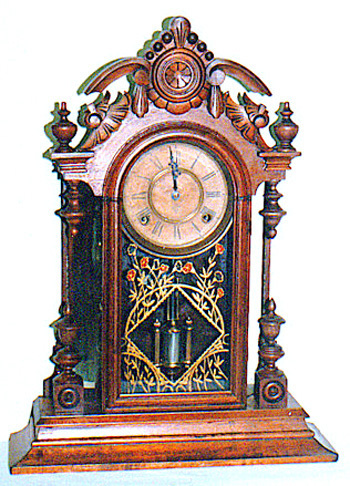 The gallery below illustrates most of the known case styles that were produced. 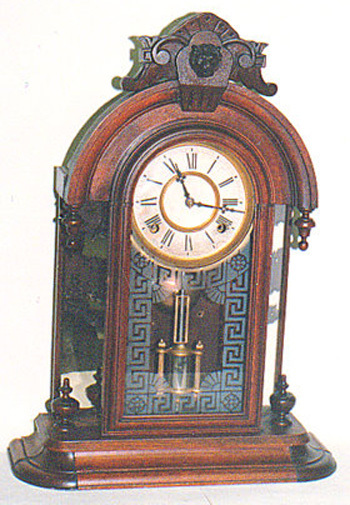 Also, for the first time, MODEL NAMES were assigned to specific case designs. 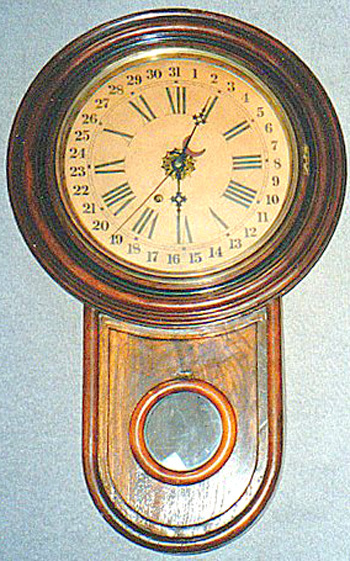 These sometimes had a Canadian connection, such as the Winnipeg, Montreal, and St. Lawrence models. Others had more fanciful names such as Montefiore, Golden Light, or Pembina. British royalty was recognized by the Victoria, the Prince of Wales, and the Crown Jewel, for example. 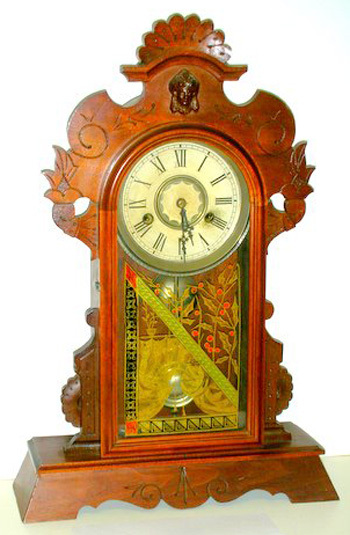 Perhaps half of the styles produced were close copies of competitive U.S. products. 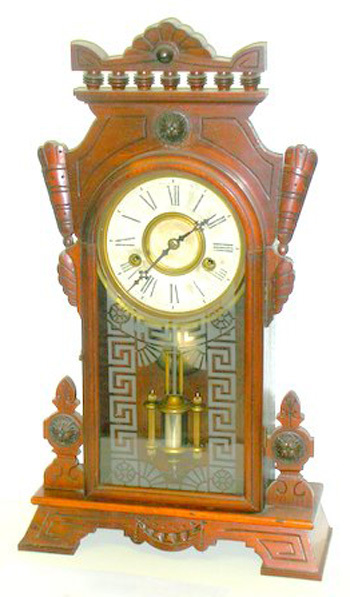 This can be seen in models such as The Victoria, the Dominion, and the St. Lawrence. 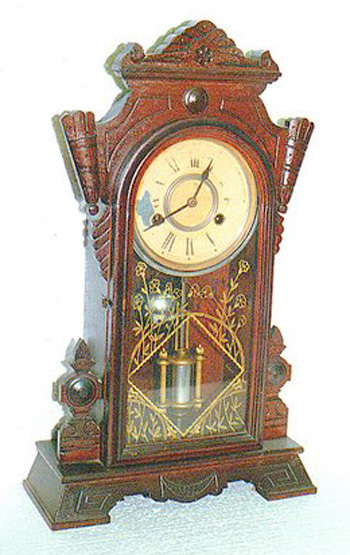 In other examples, the company made excellent cases with unique styling, such as the City of London, the City of Paris, the Niagara, and the Forest Beauty. 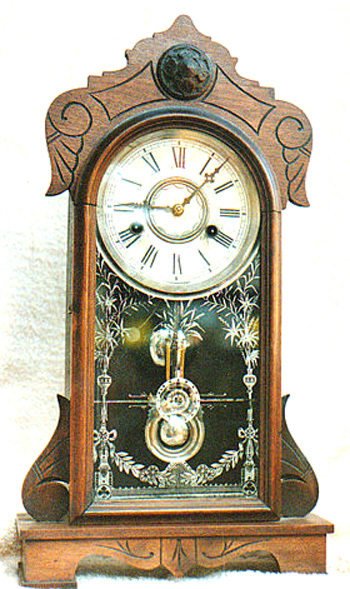 In all examples, the workmanship was of high quality. There are a couple of other points to be noted. 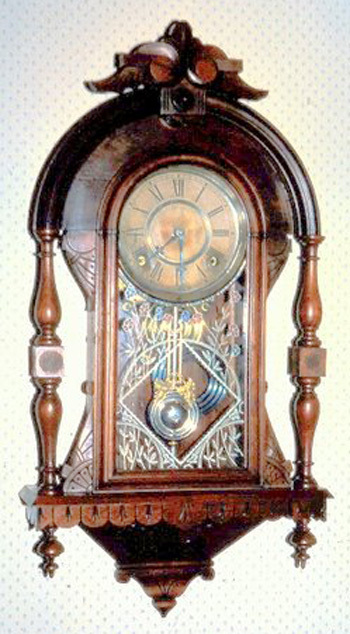 Firstly, many changes were made in the detail of the cases over time, and it would appear that the company seldom made exactly the same product from one production run to the next. 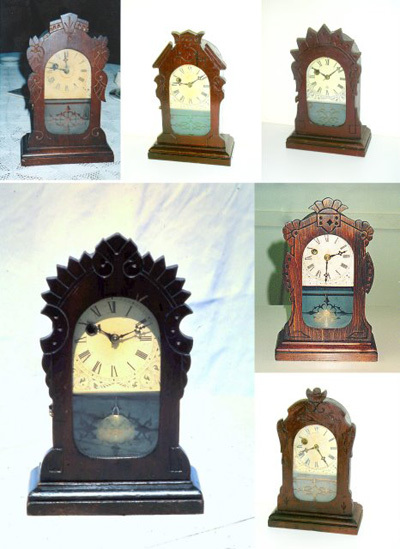 Some of these variations are shown below. 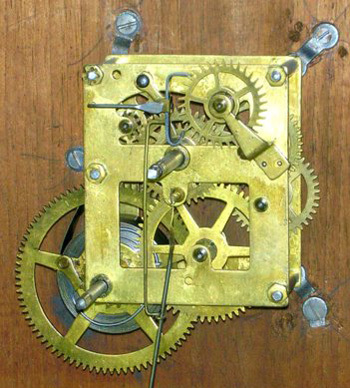 A single case style could be fitted with either a 30-hour or 8-day spring-driven movement. 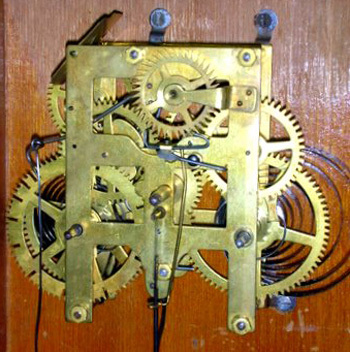 Simple calendar mechanisms were also sometimes added to either of the 8-day movements when used in wall clocks. 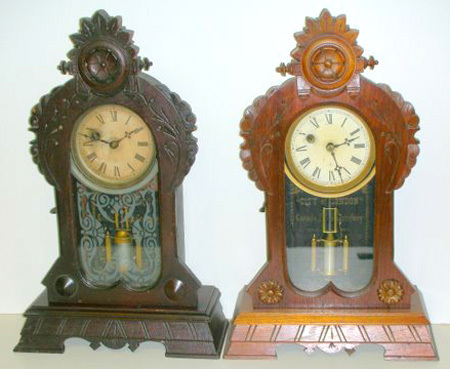 Separate alarms have been found in both OGs and some 8-day mantel clocks. 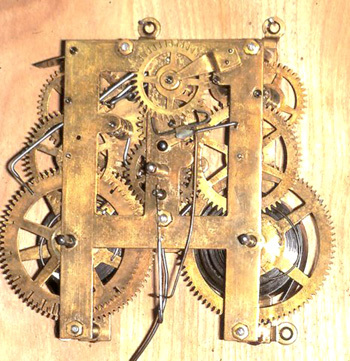 30-hour OG movement (changes were made to wheel location and spokes). There were many different printed labels used in the various models but only a few are shown here. More examples can be found in the reference book below. 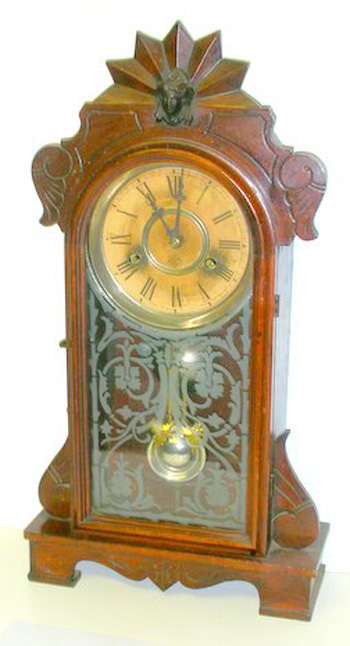 Of more interest perhaps was the use of a rubber stamp with a variety of coloured inks, including black and green, to mark the company and model name on the case backs of many of their clocks. This may have been an attempt to save printing costs during the last days of the company. 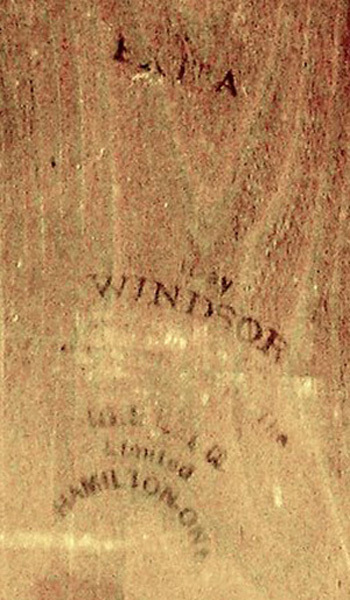 A selection of typical paper and stamped ink labels used on the clock cases. 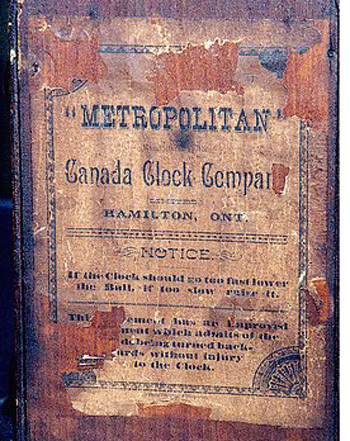 As noted with the Hamilton Clock Company, the second Canada Clock Company continued to use etched glass tablets in many of their clocks. 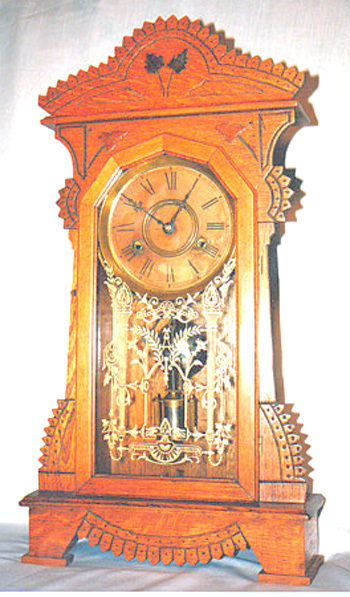 Some examples can be seen below. New patterns appeared with the new product line. There were also a variety of silk-screened tablets used. 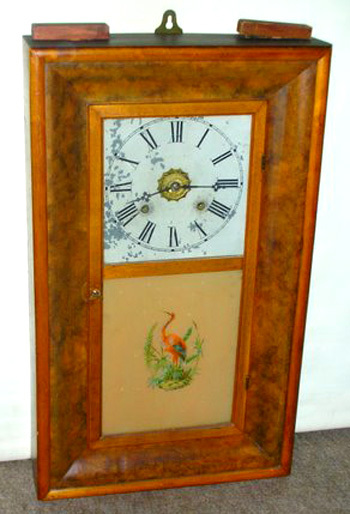 The eye-witness account mentioned above stated that “many of these were gotten up in the factory, some of them also being hand painted”. 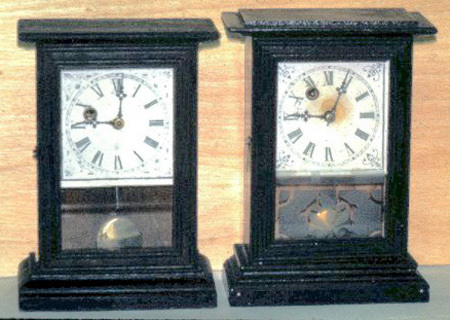 These small “cottage” clocks were offered in a variety of case styles, utilizing either the 30-hour, time-only or the 30-hour time & alarm (between-the-plates) movement. 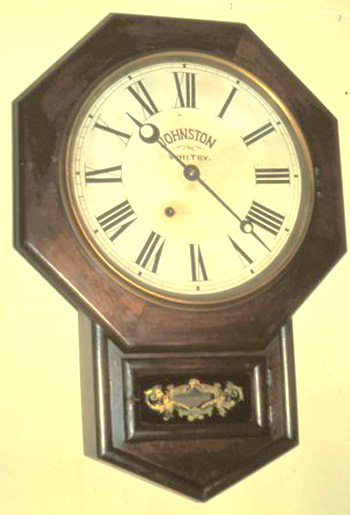 The tendency to make changes in design from one run to another can be seen with several of these models, particularly the Metropolitan, where six different versions of this cottage clock are known. 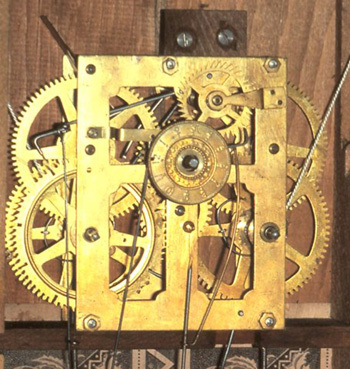 Many of these models were fitted with either 30-hour or 8-day movements as options. 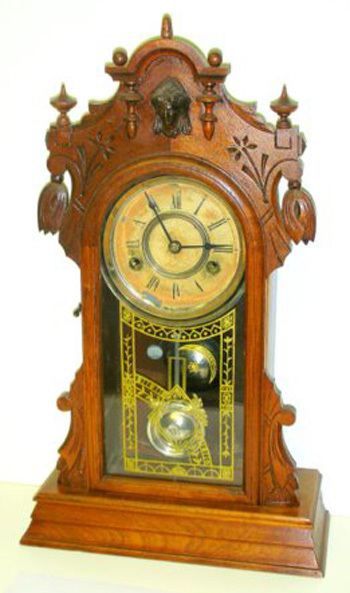 Examples with an added alarm function are also found occasionally. Other variants may exist and there may still be models that have yet to be identified. 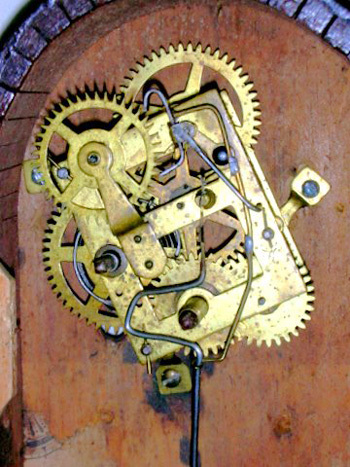 Several walls clock were offered with a variety of 8-day movements. Here are a few additional details. 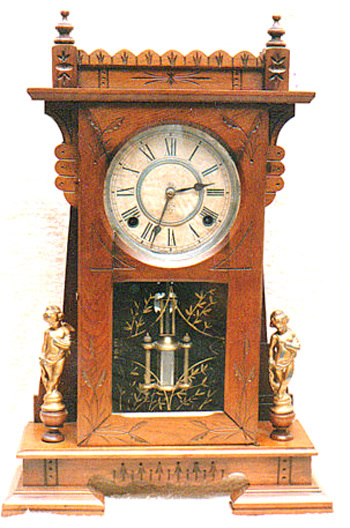 (1) Two models, the City of Paris and the Regulator, were offered in two sizes as noted above. 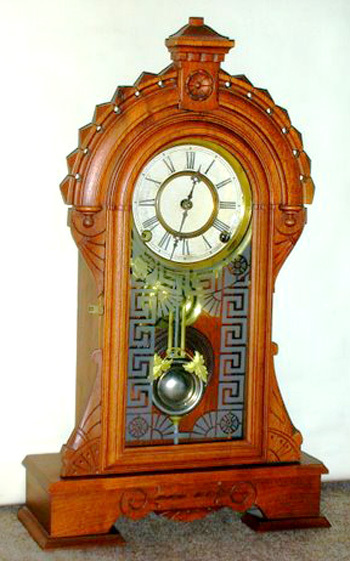 Comparative photos for both models are shown here. 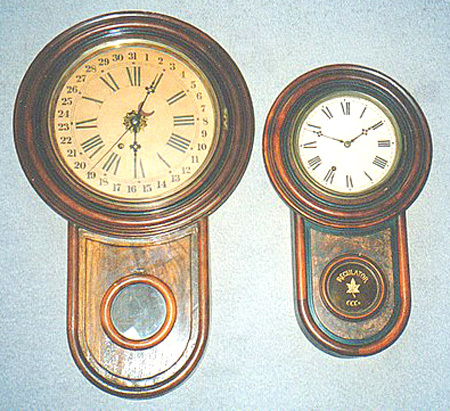 (2) Two trademarks were used on some dials. 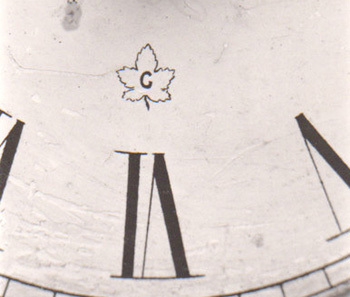 Cottage clocks often displayed a small maple leaf outline containing the letter “C”. 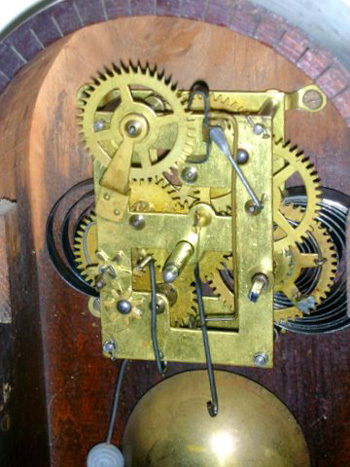 On other dials a concentric “CCCo” inside a circle was employed. 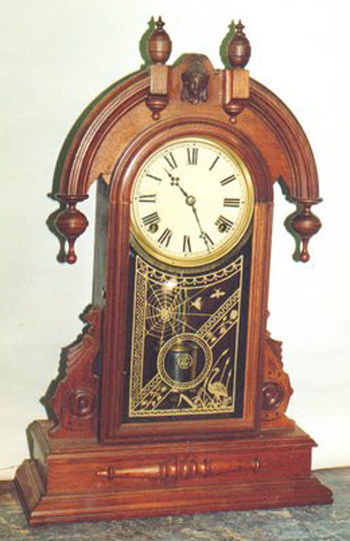 Collectors should beware of the fact that, some years later, the Gilbert Clock Company in the United States used a very similar logo with “GCCo”. Such logos should be examined carefully to avoid confusion.